Bust a move in Portal 2. For science. Gamers who happen to own the PS3-version of Portal 2 are in store for an interesting bonus later this year. 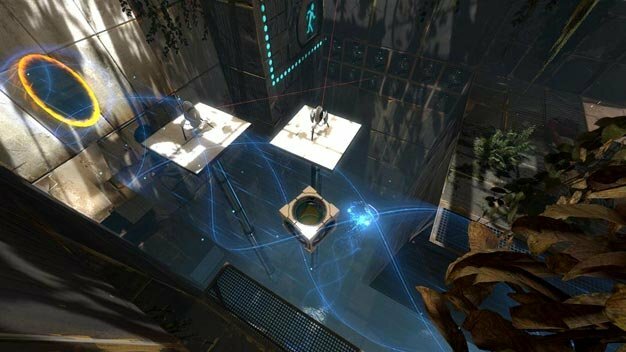 A new DLC pack for the PS3, titled Portal 2 In Motion, brings several new maps to the first-person puzzler in addition to incorporating PlayStation Move. Demoed on the E3 Show floor, the pack contains several maps that allow players to use the PlayStation Move controllers to manipulate and rescale objects in order to complete various puzzles. Previously, the content in the pack was exclusive to those who picked up the Razer Hydra peripheral. There's currently no specific date on when the pack will be available, although with Valve it's anyone's guess. Crap, I'll need Move, I guess. They're finally doing it the right way, though, by putting it into giant titles. But, if the DLC is capable without Move, that would be awesome. But the move won't be essential to completing it right? Right? When life gives you motion controls, invent a combustible Kinect and burn it's house down! I thought Sony scrapped the PS Move..
*Deep Breath* NOOOOOOOOOOOOOOOOOOOOOOOOOOOOOOOOOOOOOOOOOOOOOOOOOOOOOOOOOO... ad infinitum. Is captcha sentient and trying to tell me something or am I going nuts here? I can't even be upset over this, all those things it adds, distorting cubes and moving and rotating portals and whatever else just seems to push the game towards being easy mode. Why bother with fetching a second cube if you can stretch one until it's long enough to press down two buttons? Or why find a way to activate a light bridge if you can just turn a cube into a makeshift plank? I can't really say that I feel like I'm missing an essential part of the Portal 2 experience here. All this really means is that they are getting the same DLC that came packed with the Razer Hydra. For the uninitiated, that is the motion controller Razer made for the PC. It looks and acts like a Wiimote and nunchuk, just a hell of a lot better. From what I know it was actually pretty cool. Some new levels with new kinds of blocks that you could manipulate in special ways with the motion controls. To answer pedro directly, it will not be compatible with regular controls. That is if it's the same thing, which there is no reason to believe otherwise. Edit: As a personal unrelated side note, I really wanted to buy the Hydra, but didn't have the money at the time. If anyone reads this that has used it, shoot me a message as I'm still interested in knowing about it. Oh now this will be fun! Alright, to clear this up again for everyone: Yes, you need a Move to play this. If you are a PC user, you may use the Razer Hydra. The map pack was made up as a demo showcase for the Razer Hydra, and was therefore made specifically to show off motion controls within Portal 2. As for "oh but it will be too easy to just stretch a cube into place instead of doing this and that", such features will only be used in the DLC, which has puzzles that are specifically designed to be solved that way. You probably won't be able to "cheat" yourself through the normal campaign that way. Remember the Razer Hydra, and the PC content that valve generated to show it off? What we have here is a console port. Yes, you will need a move to play it on the PS3. Hey how about that not working on hl3? Is anyone even remotely surprised by that? This is Valve were talking about.